St. Patrick’s Day – Saturday 17th March 2018’s edition of Trojan Records official club night (brought to you by The London International Ska Festival) sees a triple celebration . .
It’s the official warm up for The London Intl Ska Festival 2018 / 30th anniversary (29 Mar-1 April); it’s the club nights 2nd birthday and it’s St. Patrick’s Day! It stars guest DJ Eddie Piller of Acid Jazz fame and your host Mistah Brown (Tighten Up!) spinning 100% rare and classic Trojan sounds! Since its launch in the summer of 1968, Trojan Records has continually led the way in presenting the very best in classic Jamaican music to fans the world over. During its early days, the company was instrumental introducing reggae into the mainstream, enjoying no less than 36 majo r UK hits between 1969 and 1975 and in so doing introducing the likes of Ken Boothe, Bob & Marcia, John Holt, Jimmy Cliff, and The Maytals to a global audience. Now celebrating its 50th anniversary, Trojan Records continues its long-standing tradition of presenting only the very best in vintage ska, rock steady and reggae sounds for your musical pleasure! 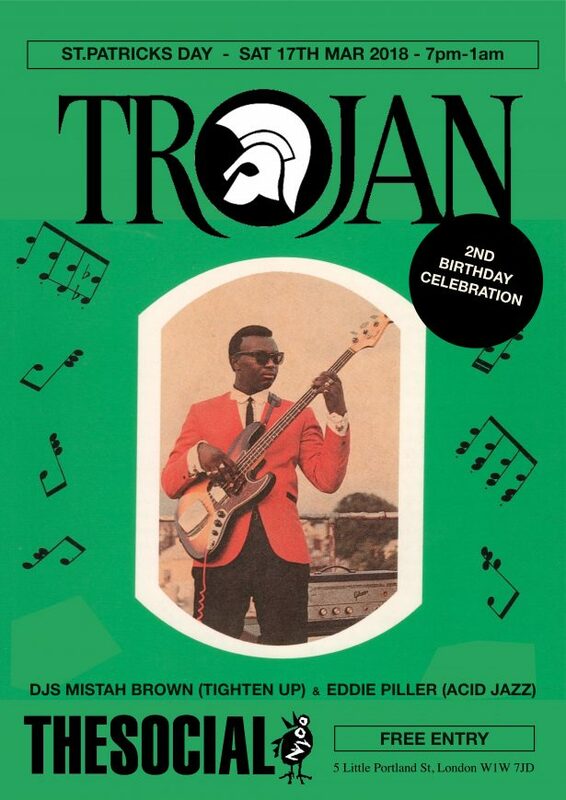 Now, teaming up with the world-famous London Intl Ska Festival, the Trojan Records official club night hits London’s west end on the second Saturday of every month! What’s more entry is FREE for all!